The Department of Landscape Architecture at the SUNY College of Environmental Science and Forestry (ESF) has, for the second year in a row, been ranked among the nation’s top programs in that discipline. In rankings compiled by DesignIntelligence, the undergraduate program at ESF was ranked 12th in the United States. The graduate program was ranked ninth. When the survey results were broken down by region, the ESF undergraduate program did even better, with employers in the northeast ranking the college second in the region. The study ranks programs accredited by the Landscape Architecture Review Board, based on the participation of leading landscape architecture firms and public practitioners. 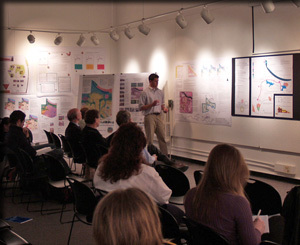 DesignIntelligence also named ESF’s George W. Curry, a SUNY Distinguished Teaching Professor and the William Munsey Kennedy Distinguished Faculty Chair, a 2007 Landscape Architecture Educator of the Year. Curry was one of only eight educators from around the country to receive the honor. He is a specialist in urban design and historic preservation.